This time round I’ve dug out issue one of the Carefree fanzine. It was a little different to the other fanzines of the time and become my favourite over its very short lifetime. Although to be honest I can’t remember why it became my favourite? Maybe my memory will get a jolt as I review it? Anyway issue one came out in the summer of August 1992 and featured Steve Clarke and Paul Elliot on the cover. It’s cover price was just one English pound and it contained 32 pages. Carefree was edited by Jim Ross and featured contributions from some of the future/past CISA people. Carefree Comment. Jim’s editorial covered a wide scope of topics. Kerry Dixon had just joined Southampton and scored 13 goals in 6 matches although it has to be said that some of these were in friendly matches. Jim was concerned that we sold Kerry without a ready made replacement just as we had done with Tommy Boyd. Kerry’s current alternatives were Graham Stuart, Joe Allon and Tony Cascarino. Jim was also concerned that Ray Houghton, Robert Fleck, Alan McInally and Dion Dublin had decided to snub Chelsea. Jim’s intro also mentioned the arrival of Don Howe whom looked to revive Alan (the toe) Dicken’s career and Ken’s apparent agreement over the sale of Stamford Bridge with Cabra. Jim also followed Chelsea in the summer to France. Despite hindrance from Colin Hutchinson. Major Talking Point was the first feature in this edition. This was a spoof interview with John Major who was the Prime Minister at the time. The interview contained references to David Mellor who had an affair. Apparently Mellor liked this particular woman to wear the full Chelsea kit. Free Speech was the fanzine’s letters page. (I always wondered how you got into the letters page of the first edition of a fanzine if you didn’t know it was coming out?) G McDermott was looking forward to a season of mediocrity. Bob Holman looked back to a season of mediocrity whilst Leeds Utd (spit) won the title. Alan Wright, whom had been supporting the Blues for 42 years was not expecting any success until 1996-97. (This guy must be Nostradamus!) Susan Smith from Stevenage compared Chelsea to the referees. Poorer and inconsistent over the previous seasons. Mad Mik Pavlovic remembered the 1979 trip to Shrewsbury in a feature titled Great Away Trips of our Time. (Now I remember why I liked Carefree.) Mik’s tale told of the usual kind of 1970s capers. I’ll try to use a few words to give you a little idea of what occurred on that day. CFCnet’s future founder Mark Wheeler tried to enjoy the summer without football in an article titled Summertime… and the living is easy? Like so many others, me included, Mark was somewhat disillusioned after the miserable end to the previous season. Cup defeat to Sunderland and the sale of Cundy to Spurs. Never-the-less after a couple of weeks of no Chelsea FC Mark found a void to fill. He even tried watching and playing cricket to make up for the football starvation! Editor Jim Ross went to Northern France to see Chelsea play Le Harve in a feature imaginatively titled Over Land & Sea. (This was at the time that Ken Bates used to invent competitions as we didn’t win the real ones.) I can remember the farcical behaviour from the club about this trip and Jim reminds me that Colin Hutchinson very helpfully, NOT, told a Chelsea northern supporters group that the game was definitely not going to be played even though Le Harve were telling fans that it was going ahead as planned. Alan Collis’s Red Card printed the date of the match and quite quickly received a few letters from the club. The letters told Alan that he had to foot the bill for the cost of policing as the police would have to travel under cover to this game now that the cat was out of the bag. As ever Chelsea lost the game mainly thanks to Cascarino who was at best, toilet. After the game many of the Chelsea fans were escorted back to the ferry port even though Jim and many others had hotels booked elsewhere. The Star Gazing feature doesn’t make very good reading. The Carefree fanzine predicts that Chelsea would finish 18th in this season (1992 -1993). Highlight of the season would be a 5 – 1 thrashing of Spurs. Jim Ross lifts the lid on The Truth Behind The Cundy, Allen & Wilson Affair. Jim shares the rumour that I heard also. Jim’s source was a player’s friend whereas mine was a coach at the club who was at the away fixture versus Man City a few days after the incident. Just to recao Ian Porterfield sold Clive Allen, Kevin Wilson and Jason Cundy after an incident on the coach coming back from the cup defeat versus Sunderland. The incident was an argument between Allen and Wilson in which Cundy stepped in. Porterfield saw the tail end of the debate and sold all three. Who The Hell Are You? Looks at the next month’s fixtures. The upcoming games were Oldham (h) Norwich (a) Sheffield Wednesday (a) and Blackburn Rovers (a). If I remember correctly Bates got his man Fleck just before the season started but he was not allowed to play him in the Norwich fixture. We since learnt that buying Fleck for 3 million wasn’t the purchase many though he would be. Just after we bought Fleck it was rumoured that a “gentleman’s agreement” was made between Bates and Terry Venables in which Spurs wouldn’t bid for Fleck and Chelsea wouldn’t bid for Teddy Sheringham. Didn’t Ken do well in getting Fleck instead of Sheringham? Pessimistic At The Start is Nick Browns seasons preview. Here’s the team that Nick thought would start the season based on the previous tour to Ireland. According to Nick’s permutations Chelsea would play a 442 formation and line up as follows: Beasant, Clarke, Elliot, Monkou, Hall, Wise, Stuart, Jones, Le Saux and two from Matthew, Myers, Allon and Cascarino. Jim’s last feature was called The Good… The Bad… & The Ugly The good piece of the article recalled an incident involving Vinnie Jones in France. To cut a long story short Vinnie had bumped into a group of Chelsea on a floating nightclub who had ran short of money. Vinnie had a chat and gave them a few quid to get some more beers. The Bad involved the now infamous incident when Colin Hutchinson grassed up a couple of Chelsea fans who were sitting in the main stand at the Le Harve match. The couple, a man and woman ,were frog matched to the away terracing shortly after Colin had left his seat. The Ugly was simply David Mellor. Just for the record here are the results from the tour. 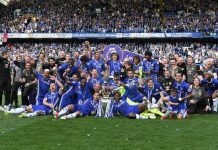 Previous articleTHE PREMIERSHIP – HAS ANYTHING CHANGED?